BBC NEWS | UK | Northern Ireland | Eat your blues! Forget the greens, Irish parents are urging their offspring to eat their blues. The blue potato is proving a hit across Ireland since it was recently introduced to the market by a Dublin family which has been growing vegetables for 200 years. The Keogh family, which trades as Cream of the Crop, grew the lesser known variety to mark the international year of the potato. Little did they guess what an impact blue mash would have on the Irish imagination. "We were overwhelmed by the response," said Tom Keogh, general manager of Peter Keogh &Sons. "It is a very, very old variety of potato. We got some of the seed last year and grew it as part of our heritage range." 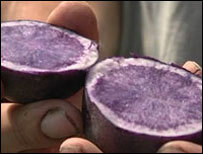 The potato is a deep indigo blue and makes colourful mash and chips. The firm aimed to appeal to children - by selling them something with a little novelty interest. The blue colour comes from the presence of anthocyanin, which is an antioxidant. Mr Keogh pointed out that the potatoes had health benefits too. "They have a deep flavour," he said, "but I'm surprised too at the backlash against the idea of eating blue food." Despite Ireland's long association with the potato, Mr Keogh said that its popularity is waning and overall sales fell by 14% last year. By introducing new, lesser known varieties, potato growers hope to rekindle interest in the humble spud.